Since starting Lori’s Original Lemonade more than five years ago, even founder Lori Volk didn’t anticipate how fast the company would grow. Volk said her specialty lemonade is now sold in more than 650 locations throughout California, including Vons, Whole Foods, Albertsons and Pavillions, with no signs of sales slowing down. Just in July, Volk again expanded by reaching an agreement for her lemonade to go into 212 Cost Plus World Market stores. “They spotted our ginger lemonade that was in New York for the sofi Award a couple of weeks ago and loved it,” Volk said. Volk’s grocery store presence isn’t the only thing that is expanding; her selection of flavors has also increased. In 2015, Volk told the Business Times that despite high demand, she was hesitant to produce plain, original flavored lemonade. The lemonade she originally produced, like lavender, lemongrass and ginger, were a little quirky and “off the beaten path,” kind of like her. But the customers spoke and Volk listened. In early July, Volk’s strawberry and plain lemonade flavors debuted at Whole Foods in Southern California. Volk said she’s now anticipating a partnership with Ralphs Supermarket, and hoping a deal is done by this summer. “It’s exciting that more and more people will get to be exposed to my lemonade,” she said. The increase in popularity also brought an increase in production. Volk said she added two additional distributors, and the California factory that produces more than 70,000 gallons of lemonade each bottling had to double its distribution staff. “It’s not all because of me, but I’d like to think we had a little something to do with that,” she said. Volk added that lemon crops are currently in high demand and it’s starting to become harder and harder to source. She strictly sources organic and certified lemons from a variety of growers throughout California — as close to her home in Ventura as possible. Volk said she’s also having complications with freight pricing increases. She said that Lori’s Lemonade has yet to increase its pricing since originally launching, but that may be problematic since pricing of production and distribution has gone up across the board. 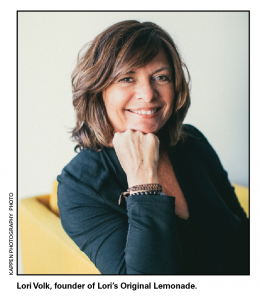 Lori’s Lemonade has also been a key contributor to her Ventura County community, doing a lot of fundraising and community events with Casa Pacifica, Taste of Camarillo and the Taste of Ojai. Last December, during the Thomas fire, Volk said Lori’s Lemonade dropped off more than a half a pallet of lemonade to volunteers at coordinating centers throughout Ventura. 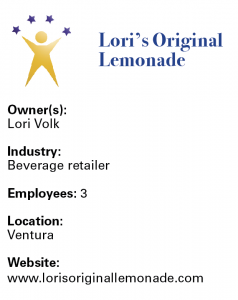 Volk started Lori’s Original Lemonade to fund her kids through college. She sold her house in Ojai back then as well, opting to live on a sailboat in the Ventura Harbor. Today, with all three of her children graduated from college and her lemonade company taking off, Volk said she’s still living in her sailboat — and couldn’t be happier.